Rolling down yield curve is return associated with reducing bonds duration which lowers over time. This strategy can increase portfolio income adding capital gains to coupons. This strategy works well only when the curve is steepening. An investor will buy a bond when it is at the highest point of the steepening yield curve and continue to hold it until its yield curve reaches a lower yield yielding point. And at this point the Investor shifts to another bond where the yield curve of that bond is at one of the highest points when that yield curve is steepening, and so on and so forth. Suppose the annualized yields of 1Y Gsec and 2Y G-Sec is 6% and 7 % respectively and both bonds are available at par at 100rs. If an investor buys a 2 year G-sec, he will receive the par value of 100 on maturity and the annualized coupons at 7%. Now let us assume that the yield curve does not change for the next year. After holding the G-sec for a year, the instrument has a year to maturity and is as good as one year g-sec with a coupon of 7% trading at a yield of 6%. Hence, if the investor sells this G-sec now, he will receive a an appreciated price on that instrument as coupon is higher than yield. The investor can now again reinvest the proceeds in a 2 year G-sec to get a coupon of 7% and repeat the same process to earn price appreciation as well as the annualized coupons. Even if the short term i.e. 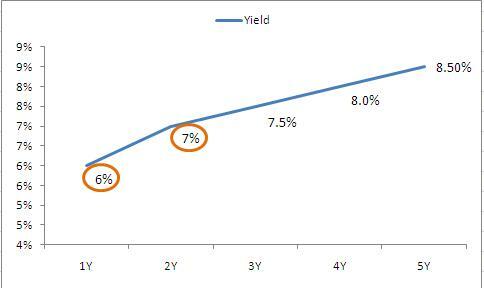 1Y yield rises 1% capital loss is nil and bond trades approximately near to face value yielding ~7% (coupon). Thus in this manner investor enjoys capital appreciation with the pre-determined coupon. This strategy is adopted by fund managers to generate alpha for investors when the yield curve is steeply upward sloping.